It has been a very warm winter so far here in the Coca Beach area of Florida. But all things must change and this week we saw some much cooler weather than we have had over the past month. This has cropped the sea surface temperatures outside of Cocoa Beach from around the 73 degree mark down to around the 65 degree mark. This is a very dramatic change for the ocean to undergo in just few days time. We have seen most of the incredible fishing action that was occurring stop by mid week in this portion of the ocean. So where did the fish go? Well, Most of them have moved south following the 68 o 72 degree temperature contour. So, for the next few weeks we will probably move our fishing operations south about 40 miles to the Sebastian Inlet area. This should put us back into the proper water temperatures that the fish like and allow our customers to catch more fish. Having the ability and the knowledge to follow the fish is one of the main reasons people book us over and over again for charters. We don’t just take you out on the water, we do our best to make sure your on the right water that holds fish. What species can we catch? As we follow the fishes preferred water temperatures up and down the coast we usually encounter a variety of species. 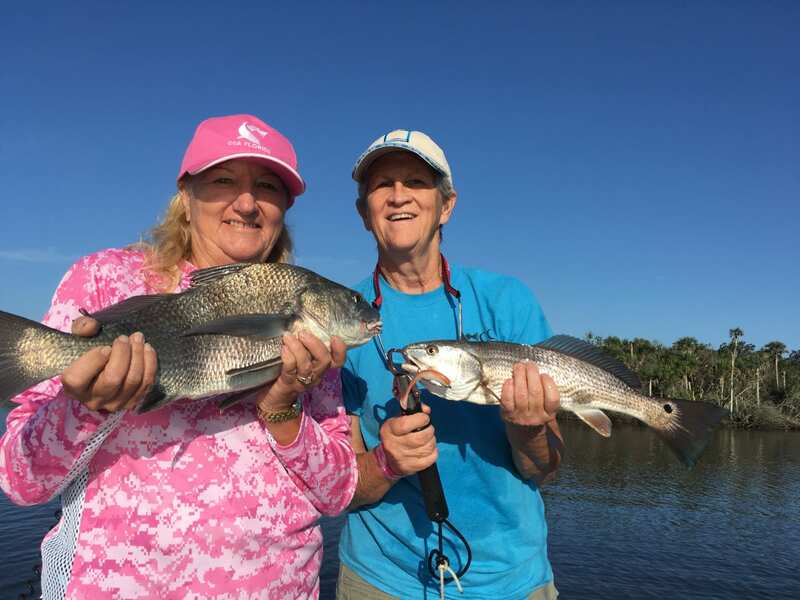 Jack, redfish, snook, flounder, pompano, tripletail, black drum, ladyfish, bluefish and trout are the main types that we catch. At this time of the year jigs, hard lures like Rapala Minnow imitations, or soft plastic lures like Saltwater Assassin sea shad can be very effective on the fish. We also like to use a variety of live offerings, basically whatever it takes to make the day a successful. As we transition through the remainder of January and into February these fish species will be the main focus of our charters. As the ocean currents warm sometime around the beginning or middle of March, the fish should return to the Cocoa Beach area and we will be right on their tails. Until next time….Catch a memory!!! Previous PostMixed weather near Cocoa Beach and Orlando is creating mixed species this month. Next PostLoads of fish to start the new years off right.